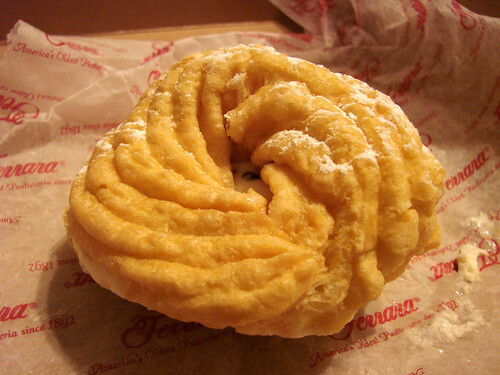 Zeppole are Italian doughnuts filled with a delicious vanilla or chocolate custard. I'd never heard of sfinge (s-fing-ee), but apparently they are zeppol-ish creatures that are filled instead with ricotta cream. 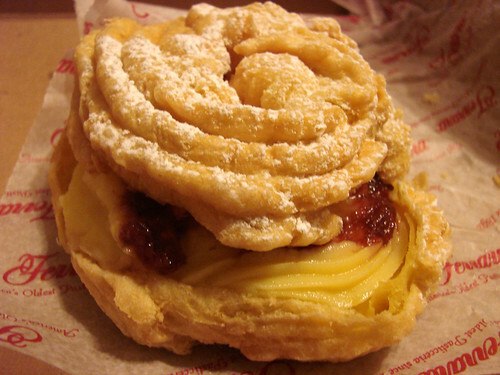 St. Joseph's Day falls on March 19th which is always during Lent. Now remember the whole all meat and dairy products were forbidden during Lent in the olden days? Well, on a saint's day you have a special dispensation from the rules of fasting and abstinence of Lent. The proximity of St. Patrick's Day and St. Joseph's Day is one of many reasons why 'tis good to be Irish-American/Italian-American. Connecticut typically conjures images of green rolling hills and lock jawed WASPs, but few people know that that Connecticut the most Italian state in the nation (take that Rhode Island!). And beside being home to the best pizza in the nation, New Haven produces a mighty good zeppole. 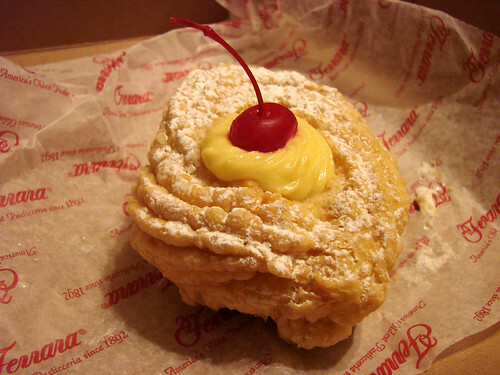 Growing up my dad would always pick up a box of zeppole from one of the Italian bakeries in downtown. To my great sadness I've not been able to find chocolate zeppole in New York. I've asked at Rocco's. I've asked at Veniero's. I've asked at Ferrera. I've asked at Villa Abate. They all look at me like I have two heads. Has anyone ever encountered chocolate zeppole in New York? 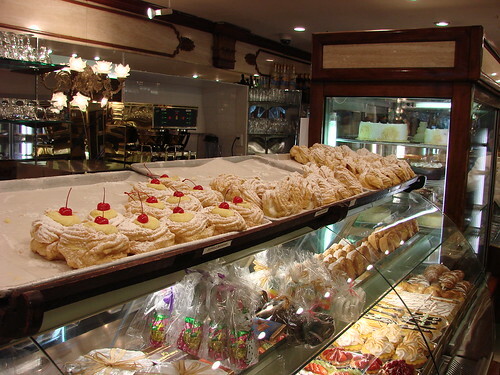 On Monday I stopped in at the venerable Ferrara's to check out their St. Joseph's Day offerings. 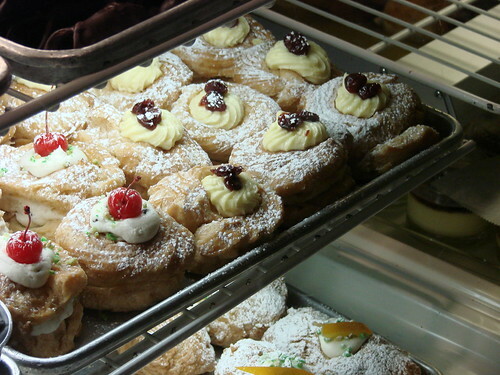 They have the vanilla custard filled zeppole, the cannoli cream filled sfinge, and the amarena--a vanilla custard zeppole with amarena cherries, all priced at $3.75. Of course I had to pick up one of each. The zeppole was strangely lacking in filling. The sfinge was good and ample. The amarena was delicious and subtle, though I prefer Rocco's custard to Ferrara's. 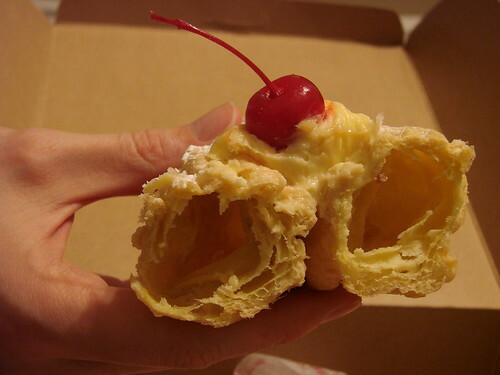 I've lived in NYC my whole life and never had a zeppole with filling! It's always been just fried dough covered in powdered sugar. What have I been missing?! 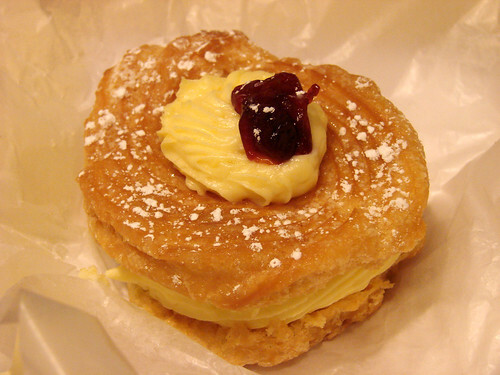 St. Joseph's Zeppole!! That's my special birthday dessert! I blog about every year. I found a tasty looking one at Zaro's on my way to work yesterday. My favorite is the ricotta filling. YUM!